I just wrote a tweet describing a Jeff Beck replica tele as a photocopy. Then I found ebay item 140257976042, which is a real-life guitar photocopier. It's a big welded steel jig, a bit like a pantograph. 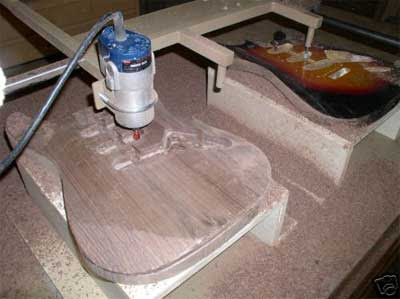 Drag one arm over the first guitar body, and a router carves its shape into the second wooden blank. No idea if the system is really detailed enough to carve crucial bits like the back of the neck, but it's probably cheaper than a CNC machine, like the one carving a nasty BC Rich clone in this awesome video (with terrible music). It's not precise enough to do the back of a neck, but that's what a spokeshave and tactile feedback is for. gibson just started manufacturing a guitar called the BFG which exploits the carving effects this machine makes. they sell it for big money and it's more or less a partially completed guitar body. these machines are most commonly used to rough in the shape on the backs and tops of archtop instruments. I bet its very effective. They use $100,000 plasma cutters to cut intricate patterns for the head boards of trailers and to create extremely crucial parts for machinery in general. Its amazing what technology can do. I had never heard of this process though, but it makes sense. Much like how they make keys, isn't it?